Lovely beachfront apartment, on two levels with large and bright living area on the first level, with two sofas, one triple (fold into a double bed) and one double. Available folding table for 6-8 people, large breakfast peninsula and a kitchenette with fridge-freezer and oven. Outside terrace with table and chairs. A convenient hallway separates the living area by a large and comfortable double bedroom (with balcony and view of Mount Etna) and a bathroom with WC, shower and bidet. Always from the living area, through the internal staircase leads upstairs, where there is a hallway with single sofa bed a bathroom with WC, shower and bidet and a large master bedroom with terrace and sea view. The Residences is located near a quaint little marina. Nearby there is also the source of the mineral waters of Pozzillo. The private access to the sea (currently under renovation), provides access to the underlying lava cliff directly from within the residence. 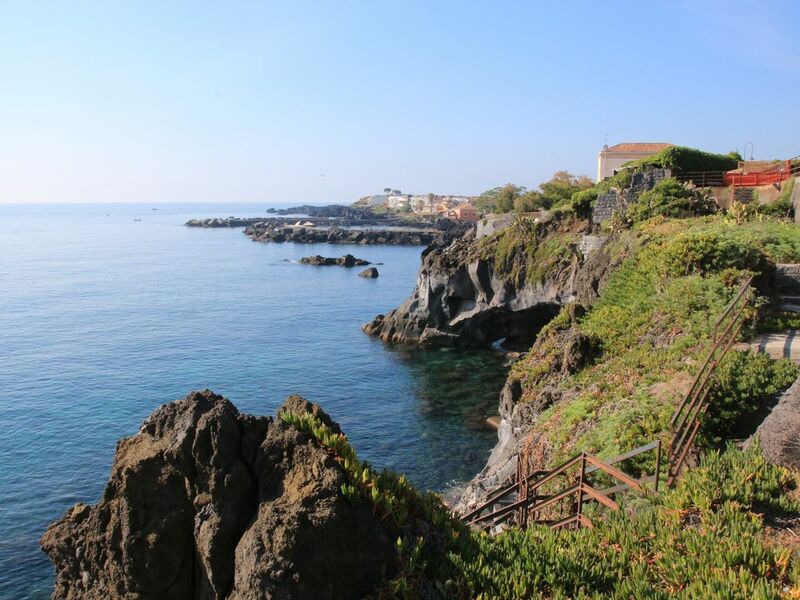 Alternatively you can access the sea through the various coves, located a few hundred meters along the coast between Pozzillo and the adjacent coastal village of Stazzo. The strategic position of the residence La Source can be reached in just 20 minutes' drive to the famous resort of Taormina and Giardini Naxos, or if you prefer the mountain, only 10 km away the picturesque foothill town of Zafferana, or perhaps a an unforgettable excursion to the craters of the Etna volcano. The airport Vincenzo Bellini of Catania Fontanarossa, is about 40 km. Weekly cleaning included in the cost of living. We had a lovely, relaxed visit of 9 days, very amiable neighbours, shopping easy in nearby villages. The views from the terraces (3) are fantastic and swimming off the rocks is wonderful! The apt. is very well equipped with dishes, pots, etc. Giuseppe was very attentive to details (even coming out from Calabria to fix the wifi) and most informative of places to visit. The village fish restaurant is very good (reserve by noon) and the pizza place as well (coffee shop not so great!). A most highly recommended rental for a lovely, relaxed holiday!!!!!! The apartment has everything you need and more. It's exceptionally clean and a warm welcome from Giuseppe. Views of Etna from the ground floor bedroom and the sea with it's stunning sunrises from the upstairs bedroom. It's on the 4th floor (the top) and just a minutes walk from the sea access. Giuseppe provides local information and maps giving additional ideas of how to spend your time. VG Internet reception. The village itself is very welcoming, limited in it's offering with one coffee bar and one pizzeria, but both are lovely. The coffee bar opens at 6am, so you can sit with the sun rising having coffee and fresh croissants/brioche followed by a walk along the harbour wall watching the fishermen take out their boats or the village coming to life as people start their working day. The pizzeria again welcoming and you can order fish with 24 hours notice or create your own meal of salad, mozzarella, meats and olives (basically from their toppings) with garlic bread for another alternative. Otherwise you would drive to Stazzo just 5 minutes away for alternative restaurants. Tip for accessing the property, head for the village harbour and as you look out to sea, bear left over a little bridge and the apartment is accessed by the electric gates into the complex. Also to stop SatNav taking you the long way around the village head for the church's carpark and just before you enter turn right and then you can turn left down to the harbour avoiding the little one way section, it's alot quicker!! I hope you enjoy your time as much as I did. Thank you very much for your accurate review. Fabulous views front the sea back Etna. Very well equipped. Giuseppe met us on time. The house was beautifully clean and had everything we needed. The village was sadly a bit run down but the locals were friendly and Stazzo (next village) had a restaurant and cafe that were excellent. A car is essential but the streets are narrow and Italian drivers are quite aggressive. The only odd thing was the charging system whereby the rent that was advertised was apparently for 2 persons in a 7 bed house. Any more than 2 were charged at 12€ per night. We have never encountered this before. I have been renting appartments for about 30 years. On the whole we had a good time and it was very interesting. Dear, Jennifer, thanks for your comment. Estuvimos en esta casas 2 matrimonios la última semana de julio. La casa está en una tercera altura enfrente del mar. Consta de 2 plantas, en la parte de abajo tiene una terraza con vistas al mar, cocina, comedor y una habitación con baño. En la parte de arriba una habitación con terraza y baño. El exterior tiene una terraza común a todos los vecinos, muy amplia y da directo al acantilado, en el que accedes por medio de unas escaleras al mar. El dueño Giuseppe fué muy amable y nos explicó todo. ausgestattet, es hat an nichts gefehlt. Wir können die Wohnung nur weiterempfehlen und kommen bestimmt noch einmal wieder. Thank you so much for the generous review, a warm greeting to you and your daughters. L'appartement était très bien situé et très confortable avec un petit bémol pour les oreillers ( en synthétique et un peu trop épais). Nous sommes arrivés très tard le lundi 14 mai et Paulo a été formidable et très patient: il a correspondu de nombreuses fois avec nous au cours de la soirée ( ce qui n'était pas facile car nous ne connaissions pas l'italien) car nous avons eu quelques petits ennuis et nous avons dû plusieurs fois annoncer notre retard qui s'accentuait. Donc un très grand merci à lui . Vous pouvez louer cet appartement en toute confiance. Pozzillo (Pizziddu in Sicilian) is a fraction of Acireale, in the city of Catania Metro. It is located in the extreme northern part of the township, surrounded by citrus gardens, on the shore of the Ionian Sea. Is about 6 km from Acireale. Its name derives from the Sicilian Pizziddu which means little bit or small cape on the sea. The village is built around the old church, which already existed in the sixteenth century, which stood right on Pizziddu and of which today no trace remains, having been demolished to make way for building speculation in the '70s. The current of the nineteenth century church building is located in the center of the country, and is dedicated to Santa Margherita. More recently formed Pozzillo Superiore is about 1 km away, on the road to Riposto. Le tariffe possono essere soggette a variazione fino alla loro effettiva determinazione al momento della prenotazione. Alla vostra richiesta di prenotazione vi verrà fornito un codice IBAN per il versamento dell'acconto di prenotazione del 50%. Al ricevimento del bonifico di acconto, e non prima di tale data, vi daremo conferma per mail della Vs. prenotazione presso la Ns. struttura. Il saldo del restante 50% dovrà essere effettuato entro e non oltre 15 giorni dalla data di arrivo. Per disdetta di prenotazione entro 60 giorni dall'arrivo è previsto un rimborso totale della quota di acconto versata. Per disdetta di prenotazione entro 30 giorni dall'arrivo è previsto un rimborso del 50% della quota di acconto versata. Per disdetta di prenotazione entro 15 giorni dall'arrivo non è previsto alcun rimborso della quota di acconto versata. Il deposito cauzionale da versare in loco, all'inizio del soggiorno, potrà essere versato solo in contanti e verrà rimborsato interamente, salvo evidenti danni accertati, alla fine del soggiorno.